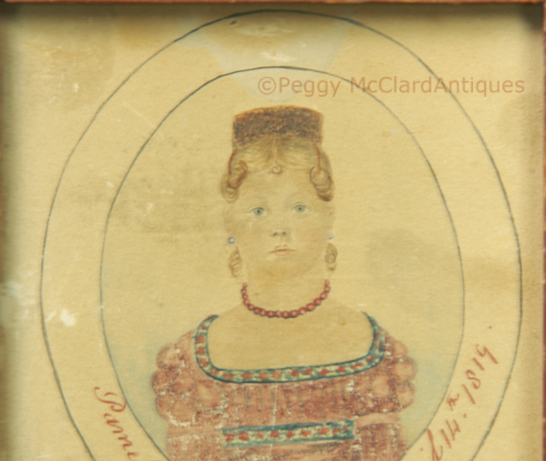 Fun watercolor folk portrait of “Pamela Jones” signed by “GS Newton”. The young lady is painted within a double drawn oval portal. She faces the viewer straight on, wears a rose colored dress with an empire waist and long sleeves that are puffed at the shoulder and appear to be tight to the wrist. Her low neckline and waist band appear to be a ribbon with embroidered red flowers, green leaves and black edging. 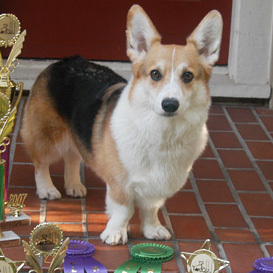 She wears her hair pulled up to a knot that is secured with a high tortoise shell comb. Her hair is parted in the center and pulled to tight curls framing her face. Two curls at the nape of her neck peek out from the sides under small hoop earrings. She wears a beaded coral necklace and has striking pale blue eyes. Please note the unframed image is a scan and it is too brown--please try and picture something in between both! 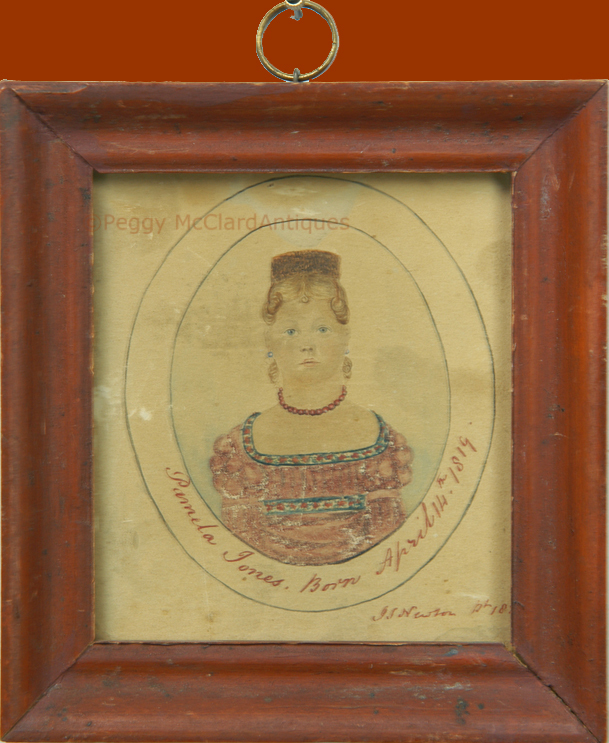 The inscription and signature is done in the same red or rose-colored watercolor as the woman’s dress. 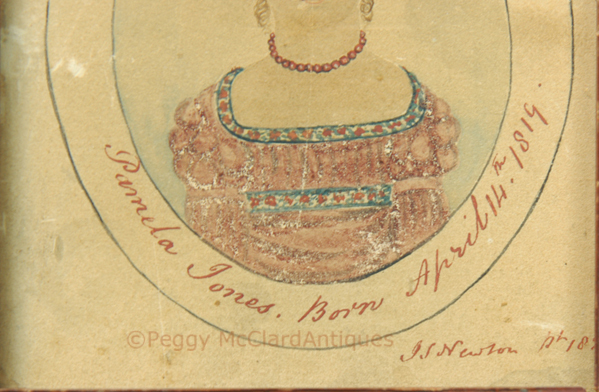 Between the two drawn apertures is the inscription “Pamela Jones, Born April 14th, 1819”. Towards the lower right corner is the signature “GS Newton __ 1824” (the 4 is covered by the frame). Whatever number or word is between the artist’s name and the year is illegible. Now, if we assume that the date 1824 is when the portrait was painted then the dates really don’t jibe with the portrait. 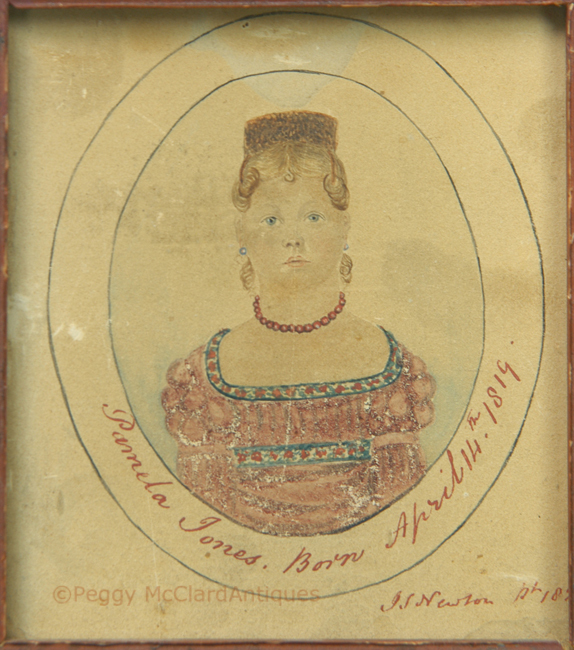 If Ms. Jones was born in 1819 then she would have been 5 in 1824. The woman in the portrait is definitely an adult—she appears to be around 20 years old. 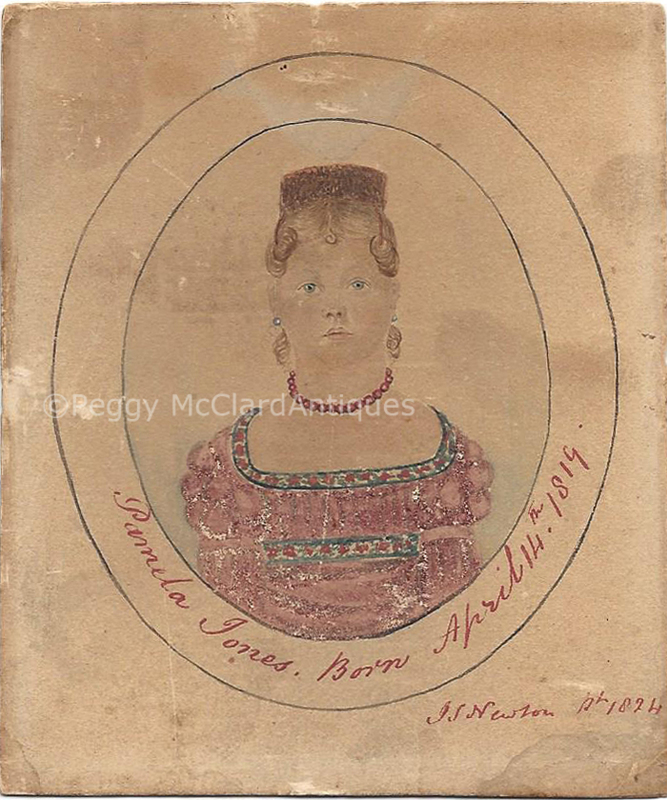 The clothing and hairstyle date the portrait to the first half of the 1820s, so it appears that artist made a mistake about Pamela’s birth year. It’s not too unusual for women to have fibbed about their ages to artists but surely this was the artist’s mistake instead of Ms. Jones trying to pass for a five year old! The portrait resides in a period frame that was probably originally gilded. It is currently painted a nice dry red and has a brass hanging loop. Framed size is 5 1/8” x 4 ¾”. As you can see, there is overall toning to the paper, fading to the paint and some loss where gum arabic was used to highlight the dress. There was a label on the back that indicated that the artist was Gilbert Stuart Newton but there is no way that this was done by Gilbert Stuart Newton. I’ve removed the label so that the portrait will not be sold as such in the future. What we have is a fun, folky, American School watercolor portrait of a pretty lady with lots of character and a bit of humor with the dates. Circa first five years of the 1820s.